It is time for us all to spring forward and let the spring cleaning commence. We have endured a very wet winter and the forecast for spring is to be wetter than normal. Let’s all hope the forecast is wrong. It is important to remember while spring cleaning around your property, never blow your debris into the street. The debris in the street ends up in the parish drainage system and slows this very important process down. We all love our neighborhood and I encourage you to clean the streets in front of your homes. Please make sure to clean any debris in drains and please don’t forget to help your neighbors that are not able to do this or even the ones that just don’t do it. I realize I am asking a lot from a few but good deeds never go unnoticed and our neighborhood becomes a much better place to live. I am excited about the time change coming and will enjoy the longer daylight hours for relaxing in my yard. I find it very comforting to see so many neighbors walking, running, biking, playing with their children and enjoying their neighborhood. Please make sure to slow down when driving along neighborhood streets. The best neighborhoods are the safest neighborhoods for all. Our speeding campaign is in full swing. If you have not picked up your signs for the front lawns, please do so and encourage all of your neighbors to get a sign to displace as well. The more visible our campaign to reduce speeding is, the more success we should have in eliminating the speeding violations on our neighborhood streets. The annual membership drive began in January and we have been very fortunate to have so many returning members join us again this year. If you have not had the opportunity to renew your membership please do so at the March 12, 2019 meeting coming up or we also have membership renewal on our website at suburbanterrace.org. We look forward to seeing you all at our next meeting. JPSO officers were present to give the update on our neighborhood Crime Stats and offered more advice to reduce crime in our neighborhood. Our neighbors were given time to ask questions and get the answers to their concerns. Cristina Berthelot, marketing manager with Ochsner, spoke to us about the farmers market opening in the Ochsner Rehabilitation Center’s parking area. We are very fortunate to have a beautiful fresh market from 3pm – 7pm on Wednesdays. I have enjoyed going weekly to stock up on fresh vegetables, seafood, cheeses, sausage, breads, juices, and some already prepared meals. Please make every effort to stop in and make weekly purchases. Sebastian Rey, our IT Specialist presented a program about our neighborhood history. It is very interesting to understand how our neighborhood got started and the transformation thereafter. Our neighborhood is constantly evolving and learning about our history can shape our future. Thank you Sebastian for your efforts. Our 1st Vice President Dr. Stacey Spies had some getting to know your neighbor games for us to share. The greatest part of being a member of your Civic Association is the the opportunity to meet your neighbors and with Stacey’s hard work, we are a step closer in that process. Thanks to all of our speakers for sharing their knowledge with us in an interesting and informative way. The General Membership Meeting will be held on Tuesday, March 12, 2019 at Jefferson Playground, Golden Age Center (4100 South Drive). The doors will open at 6:30 pm and we will start promptly at 7:00 pm. Our first guest speaker for this meeting will be Parish President Yenni with his State of The Parish presentation. He will have a visual presentation followed by question and answer session. We are very fortunate to have the support of our JPSO Officers. They will be joining us to update our crime stats in the area and to answer any questions from our neighbors. Cristina Berthelot with Ochsner will join us again for more farmers market updates to help your shopping journey. Please remember this is an election year and keeping informed about our parishes progress will help to give you insight on Election Day. We thank anyone in advance for donating a dessert for the community table and we will most graciously accept all. Our next General Membership Meeting is on May 14, 2019. Milton Schleismann, New Orleans District Manager, and Rose Broggi, Agriculture Environmental Specialist, will present “How to Hire a Properly Licensed Landscape Horticulturalist and Arborist without being Scammed”. The more you know the better educated you will be when making expensive decisions for your property. We have also reached out to Mosquito Control to speak. This has been a very wet year so far, and I am sure the mosquitos will be out in full force. Hopefully we will all gain knowledge to prevent this insect from harming us and our loved ones. We hope you will make every effort to attend. Thank you all and look forward to seeing you! I hope your holiday season was filled with family love. Christmas to me has always been to focus on family values, and spending this time together is equally important for our younger generations to build on traditions. My family traditions began over 80 years ago when my Dad’s Sicilian family first decided to do a Christmas Day family reunion. My Sicilian Grandfather was one of 14 children and the list of my relatives goes on from there. I have never missed a Gagliano family reunion and pray this tradition continues well past my lifetime. We were fortunate to celebrate with 128 family members and many blessings were bestowed on us. We all rang in the New Year opening our doors to new possibilities for our future. This neighborhood has been blessed with wonderful, sharing neighbors and our 2019 forecast for an even stronger neighborhood is well on it’s way. STCA wishes you a Happy New Year filled with HEALTH, HAPPINESS, and LOVE. The campaign to reduce speeding on our neighborhood streets is well underway. We have distributed about 70 signs to our members. We will have more signs available for our members to pick up on January 8 at our next General Membership meeting. The more signs visible in our neighborhood the more impact we should get. I have seen vehicles slow down when they see a sign, so please participate in this worthy venture and help put a stop to this dangerous violation affecting our quality of life. JPSO officers were present to give the update on our neighborhood Crime Stats and offered more advise to reduce crime in our neighborhood. Our neighbors were given time to ask questions and get the answers they were looking for. Our November meeting discussed the Ochsner Expansion. Our guest speaker was Ms. Emily Arata from Ochsner. She used visual aids to review all the upcoming improvements and how we will be affected. She discussed the Michael R Boh Center for child development, West Tower Parking, Tom & Gayle Benson Cancer Center, Innovation Center Plans (Smart Hospital), Rehabilitation Hospital, Community Initiatives, Chamberlain School of Nursing with grant opportunities, Ochsner Day of Service, and planned infrastructure improvements. Lots of information for our residence and many thanks to Ms Arata. Kim Catalano Realtor sponsored a Turkey raffle. She gave away 10 turkeys to some very happy members. Thank you Kim! The General Membership Meeting will be held on Tuesday, January 8, 2019 at Jefferson Playground, Room # 2 upstairs in the gym (4100 South Drive). The doors will open at 6:30 pm and we will start promptly at 7:00 pm. Our first guest speaker is Ms. Emily Arata from Ochsner. She has asked to come back to introduce the opening of the neighborhood farmers market. She will have lots of helpful information for you about the market, vendors, parking, time and more. This is very exciting for us and we also thank Hippie Kitchen for reaching out to Ms Arata to get this venture going. Our very own IT specialist Sebastian Rey will be our 2nd guest speaker for the evening. He has continued to research and gather more historical information on our neighborhood. It is very exciting to know how our neighborhood was established and this helps us to look ahead. Dr. Stacey Spies our First Vice President will take over after Sebastian with “Getting to know your Neighbor Games” that she has developed to improve community relationships. This was a big success for our members in November 2017 and we want to open our doors for better relationships in 2019. Our annual membership drive is this month. We are asking all of our members to please continue supporting your Civic Association and to help in this effort please encourage your neighbors join too. United we are strong! Our next General Membership Meeting is on March 12, 2019. We have invited the Jefferson Parish Planning Department Director to address our members about the River Road Condo project and are awaiting confirmation. We have also reached out to Mosquito Control to speak. We hope you will make every effort to attend. Thank you all and look forward to seeing you! It has been a hotter than average summer for us all and hope you have been able to find ways to stay cool. We have all had the good fortune of a quiet hurricane season until this week and luckily dodged the bullet with Gordon. We are all sending our good thoughts and prayers to all the lives impacted by this storm. Hurricane season is now at its peak and we must all stay vigilant. It is important to have a hurricane preparedness plan with a list of important things to accomplish and a timeline to follow to make sure you can complete your list before the weather would hinder you. Remember to always check on our fragile neighbors that may need a hand in preparing for a hurricane threat. As the new waves roll off the coast of Africa into the Atlantic Ocean or the churning happens in the Caribbean Sea, let us all keep a sharp eye and hope for an uneventful end to the hurricane season. The cool days of fall can’t get here quick enough for me and will bring us a fresh breathe of crisp air. STCA was alerted at the last general membership of a possible new Shock House in the works on Jefferson Highway. This was very concerning to us and felt our opposition of this project would continue to preserve our beautiful neighborhood. We diligently worked with neighbors to oppose this project to our parish representatives office ( Councilman Johnston) . We are very pleased to announce this project will not happen on Jefferson Highway at the site of the old Hubcap Annie property. Thanks to all of our neighbors for standing strong to oppose this and to STCA for giving us a large powerful voice. The larger our organization becomes the more weight we carry in our fight to preserve our great neighborhood. Keep up the good work. We are focused on reducing the speeding violations on our neighborhood streets and are continuing to move forward with this campaign effort. The yard sign design is close to completion and options will be discussed at our General Membership Meeting. We are continuously brain storming new ideas at our board meeting in an effort to abolish speeding violations on our neighborhood streets. Crime prevention takes determination and a great sense of awareness. We have been fortunate that the crime in our neighborhood is petty in comparison to violent crime in other areas. However is any crime petty to our victims? (NO) It is never petty and we want to make sure we are addressing this problem. The more educated we become on this issue the less likely we will become victims. Keep your eyes open and be diligent in reporting any suspicious activities you witness as neighborhood safety is a priority. Our business expo was a great success. Bringing the businesses and neighbors together was our goal and watching the interactions at the close of the meeting was inspirational. It is important to support our neighborhood businesses in an effort for them to thrive. Thanks to all the businesses for their participation and to all the businesses joining our associations. Our voice is growing by the the day. Thanks to your support! The General Membership Meeting will be held on Tuesday, September 11, 2018 at Jefferson Playground, Golden Age Center (4100 South Drive). The doors will open at 6:30 pm and we will start promptly at 7:00 pm. We are dedicating our September meeting in honor of our 1st responders. We have booked Amanda Callagero, District Attorney’s Office Juvenile Crimes, to update information about new laws and juvenile crime in Jefferson Parish. We are very fortunate to have the support of our JPSO Officers. They will be joining us to update our crime stats in the area and to answer any questions from our neighbors. Please mark your calendars for October 16, 2018 NIGHT OUT AGAINST CRIME PARTY. Rock N Soul will provide the music. STCA will be providing food and drinks. Our event time is from 6:00 pm to 8:00 pm. We hope you all can attend to take a bite out of crime. Our next General Membership Meeting is on November 13, 2018. This is a very important meeting that will address the Oschner Expansion which affects all of us. The November meeting will be dedicated to this topic and related issues concerning residence. We hope you will make every effort to attend. Thank you all and look forward to seeing you! The heat is upon us and my best advice in dealing with the heat is to take it slow when working outdoors. Drink plenty of fluids before you venture out and take multi breaks to cool your body temperature down. Remember if you become dizzy, nausea, lightheaded or your heart is pounding get out of the heat immediately and seek medical attention if needed. Heat exhaustion, heat stroke, and dehydration can be life threatening. Please be safe out there and if you see a neighbor in need please get involved and offer to help. We have many fragile residents in our area and helping them to bring their garbage can to the curb and back or bringing the mail and /or paper to them is a great help. Thank you all in advance for your community services it is always appreciated. I and several of the board members attended the town hall meeting about the Oschner Expansion on June 21, 2018 at the Yenni Building. All of the improvements planned will take place between Causeway and the New Orleans city line. STCA is very disappointed and feel as though we are being left out of much needed improvements along Jefferson Highway between Causeway and Clearview. Several of us addressed the Town hall officials and expressed our concerns. 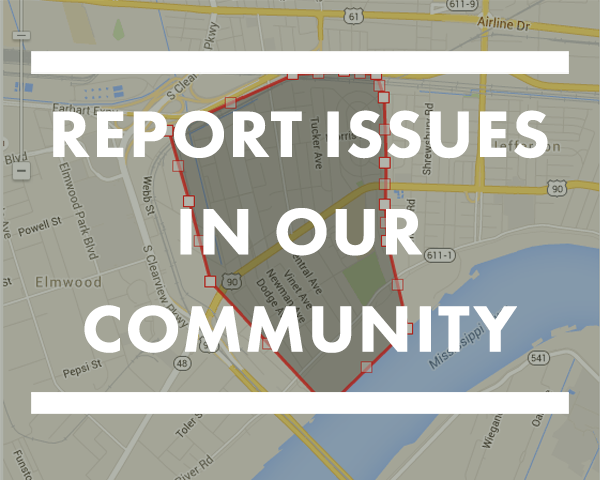 It is very important for you to express your disappointment to our elected officials on a state level about the proposed improvements on Jefferson Highway and our area being excluded. We would like new usable sidewalks, and curbing along Jefferson Highway, safe crosswalks and business improvement grants too. Oschner’s main campus is on Jefferson Highway but they also have offices in Elmwood and Clearview and we are the go between but yet our area is not slotted for any improvements. It is simply ridiculous to think that everyone going to Oschner is going to use Causeway and not Clearview or the Huey P Long Bridge and then right through our neighborhood. We will continue to speak out on your behalf and hope our voices will be heard. Please help with this effort by contacting Rep. Camron Henry at 504-838-5433. Our Civic Association is committed to improving and protecting our incredible neighborhood and your support is the only way we can do it. The bigger our voice the more effective we become. We have also reached out to Councilman Paul Johnston’s office to set up our November 13, 2018 General Membership meeting about the Oschner Expansion and Improvements. Our May meeting hosted several wonderful speakers. We would like to thank Rachel Skowyra our new Recycling Coordinator with Waste Connections for teaching us the proper way to recycle. If you missed her presentation I am positive you are putting the wrong items in your recycling bin (I was). Please go to SUBURBANTERRACE.ORG and look for the link to proper recycling. Thank you Andrea Thames, with Nurse-Family Partnership Program. She presented programs that are available and sponsored by The Louisiana Department of Health. We thank Michael Greer Volunteer Coordinator for Canon Hospice and Akula Foundation for explaining volunteer programs that are available with their foundation. We consider STCA to be very fortunate to have JPSO send us 4 officers for our meeting. They provided us with crime stas for our area, gave us information about the opioid crisis and answered our member’s questions. A tremendous Thank You to JPSO. Thanks to all of our members in attendance, your encouragement keeps us going. The general membership meeting will be held on Tuesday, July 10, 2018 at Jefferson Playground, Golden Age Center (4100 South Drive). The doors will open at 6:30 pm and we will start promptly at 7:00 pm. We will be featuring our Business Expo this month. We are a community with residences and businesses side by side. STCA’s goal for 2018 was to bring its members and businesses together. The business owner or representative will be given 3 to 5 minutes to address the membership about their business and the services they provide. We will also be giving you the opportunity to mingle and ask questions. We are very excited about this event and hope you will all join us in getting to know your neighborhood businesses better. We thank anyone in advance for donating a dessert for the community table and we will most graciously accept all. Please mark your calendars for our next general membership meeting on September 11, 2018. We are dedicating our September meeting in honor of our 1St responders. We have booked Amanda Callagero, District Attorney’s Office Juvenile Crimes, to update information about new laws and juvenile crime in Jefferson Parish. October 16, 2018 is NIGHT OUT AGAINST CRIME PARTY. Rock N Soul will provide the music. STCA will be providing food and drinks. We hope you all can attend. Please make every effort to attend November 13, 2018 meeting about the Oschner Expansion. Hoping your 4th of July was a BLAST! Here is to a LAZY LABOR DAY! Our chilly winter has come to an end and spring is all around us. We have had some torrential rains this spring and have all faired out pretty well with only some street flooding. The ribbon was cut on the Clearview/Earhart detention ponds into St Peter’s Ditch with the improved pump station. The drainage improvements will directly impact our Old Jefferson area in a positive way. Thank you Jefferson Parish for continuing to improve our drainage. Our annual Spring Fling took place on April 21, 2018 at 12 noon in the Gym. It was my pleasure to meet so many new members at such a fun venue. We had members dancing to the tunes played by Rock N Soul, children enjoying the games provided, and I especially enjoyed our members falling in love with the adorable adoptable puppies from “PAWS”. A huge thank you to HIPPIE KITCHEN for the delicious treats they donated to our community table. The next time you would like to dine out please consider supporting our newest business HIPPIE KITCHEN on Jefferson Highway. We have had many requests to address the traffic speeding issues on our neighborhoods streets. We are working closely with Councilman Johnson’s office trying to come up with solutions to an ever growing problem. Our Civic Association is committed to improving and protecting our incredible neighborhood and your support is the only way we can do it. The bigger our voice the more effective we become. Our March General Membership meeting hosted the candidates for Sherriff of Jefferson Parish. It was our pleasure to introduce Sheriff Joseph Lopinto and John Fortunato. Each candidate had the opportunity to introduce themselves and share their experiences and hopes for the future of Jefferson Parish Sheriff’s office. Many of our members where given the opportunity to ask questions and personally interact with the candidates. We the citizens of Jefferson Parish voted on March 24, 2018 for our new Sheriff Joseph Lopinto. One of our greatest rights to Freedom is our vote for the elected officials within our Parish. These elected men and women will lead us toward our future. We hope the opportunity we had to meet the candidates face to face gave you a better insight into knowing which candidate was the right choice for your vote. Thanks to all of our members in attendance, your support is inspiring. The general membership meeting will be held on Tuesday, May 8, 2018 at Jefferson Playground, Golden Age Center. The doors will open at 6:30 pm and we will start promptly at 7:00 pm. We will be featuring 4 speakers this month. Our first speaker will be with Human Services Authority and DEA. There topic is the Opioid Crisis in Jefferson Parish. This is an alarming issue we are all faced with if not directly but indirectly. The second speaker is Rachel Skowyra our new Recycling Coordinator with Waste Connections. She believes she can help us improve recycling in our area by educating our members with the latest information available. The third speaker Andrea Thames is with Nurse-Family Partnership Program. The Louisiana Department of Health has many programs to help and Ms. Andrea has new information for us. The fourth speaker is Michael Greer Volunteer Coordinator for Canon Hospice and Akula Foundation. There are many of our neighbors whom are giving and this will be a great opportunity for our members to learn about other volunteering programs that are worthy of their loving time. We are celebrating Cinco de Mayo and will be serving Chips and Salsa. We thank anyone in advance for donating a dessert for the community table and we will most graciously accept all. Please mark your calendars for our Business Expo on July 10, 2018. Our meeting beginnings at 7:00 p m and takes place at the Jefferson Playground Golden Age Center. We are a community built on a variety of talents and this expo will give our members the opportunity to meet our business owners and staff. We are dedicating our September 11, 2018 meeting in honor of our 1St responders. We have booked Amanda Callagero, District Attorney’s Office Juvenile Crimes, to update information about new laws and juvenile crime in Jefferson Parish. Wishing you all a Safe Memorial Day! Happy Mother’s Day and Happy Father’s Day! “WE HAVE TREES.” The planting along Jefferson Highway between Causeway and Clearview is the first significant step that Jefferson Parish has taken to beautify our area of Jefferson Highway. We are in hopes that this will encourage new businesses to invest in our community as well as existing businesses to make improvements. The planting plans for the highway trees were provided by Jefferson Parish Parkway Department and were submitted to the State for approval and permitting. This planting has followed the strict guidelines for highway median planting improvements. The specific trees planted include Crape Myrtle, Savannah Holly, and Little Gem Magnolia. These selected trees have a moderate growth habit including heights of 20’ – 25’ and widths of 8’ – 12’ with minimally invasive root systems. A Tremendous Thank You to Councilman Johnston and staff for not only their support but for the funding to make this project happen. Our Civic Association is committed to improving and protecting our incredible neighborhood and hope you will join us for this journey. Our January General Membership meeting hosted the candidates for Constable of the Fifth District. It was our pleasure to introduce Constable Allen Leone, Jr and Mr. Jack Rizzuto. Each candidate had the opportunity to introduce themselves and share their experiences and hopes for the future of Jefferson Parish Constable’s office. Many of our members where given the opportunity to ask questions and personally interact with the candidates. We the citizens of Jefferson Parish will vote on March 24, 2018 for our new Constable. One of our greatest rights to Freedom is our vote for the elected officials within our Parish. These elected men and women will lead us toward our future. We hope the opportunity we had to meet the candidates face to face has given you a better insight into knowing which candidate is the right choice for your vote. Thanks to all of our members in attendance, your support is uplifting. The general membership meeting will be held on Tuesday, March 13, 2018 at Jefferson Playground, Golden Age Center. The doors will open at 6:30 pm and we will start promptly at 7:00 pm. The election for Sheriff will be held on March 24, 2018 and we feel it is important to meet the candidates. We are very proud to present our two guest speakers, Mr. John Fortunato and Sheriff Joseph Lopinto. These men are running for Sheriff of Jefferson Parish and will be asking for your vote. This will be a great opportunity for you to meet the candidates face to face. Both candidates will be given the opportunity to introduce themselves and share their experiences, education and thoughts for the future of the Jefferson Parish Sheriff Department. Our members will have ample time to ask questions and interact with the candidates. We hope this forum will help guide your decisions on Election Day. We are very fortunate to have both of the candidates for Sheriff joining us. Please make every effort to attend this general membership meeting as this election is important for our continued safety in our parish. We thank both men in advance for joining us and wish them luck in this election. Please mark your calendars for our Spring Fling on April 21, 2018 at 12:00 noon to 2:00pm. We will have food, music, children’s games, pet adoption, and a photo booth for your pleasure. This is a great way to spend time with neighbors, meet new neighbors and for your children to meet and play. Pease let us know if you can volunteer to help set up or clean-up for this event. . Also we would like for you to mark your calendars for our May Meeting. The date is May 8, 2018 at 7:00 pm at Jefferson Playground, Golden Age Center. We will be hosting the Human Services Authority and the DEA to share information about the Opioid Crisis in Jefferson Parish. This is a very sad and challenging issue for us and has devastating consequences. We wish you all a Fun St. Patrick’s Day and a Blessed Easter! 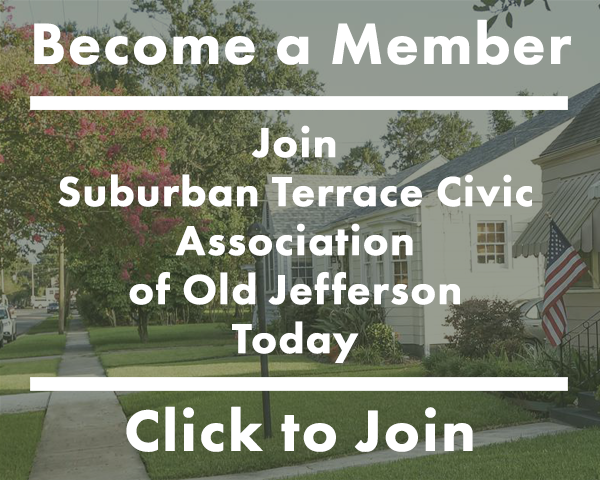 SUBURBAN TERRACE CIVIC ASSOCIATION, INC. Article 1. – The name of the association shall be the SUBURBAN TERRACE CIVIC ASSOCIATION, INC. Article 2. – The purpose of the Suburban Terrace Civic Association, Inc. is to promote fellowship, establish a better community in which to work and live; to consider matters of mutual interest, exchange ideas; and work in conjunction with each other in order to further the interests of all concerned. Entire area bounded by the railroad tracks (Illinois Central Railroad) on the North, River Road to the South, St. George on the West and Hyman and Lions on the East. Associate memberships may be granted to owners of all multi-unit residential property within the boundaries of the organization. This membership will entitle the associate member to a single vote, regardless of how many units he represents. Sec. 1 – All officers mentioned in Article 4 should be elected by majority vote of the members present at the Annual Meeting as defined in Article 6. The office of the President shall be term limited to a two year term with the option of serving another consecutive two years. If the President declines a second 2 year term, the 1st Vice-President shall assume the office with the same options as the President. Sec. 2 – Vacancy in any office shall be filled for the unexpired term by appointment by the President, whose appointment must have approval of the Advisory Board by majority vote. Sec. 3 – The membership reserves the right to remove any officer or officers of the association or to recall any committee chairperson or committee member by two-thirds vote of the members present at a meeting called especially for this purpose and so stated in the call. Sec. 4 – Names of persons to be candidates for officers in the biennial election of this association shall be presented at the January business meeting of the election year by a nominating committee appointed in open session by the President. The nominating committee shall consist of three (3) persons. The nominating committee may present to the Association the names of one or more persons for each office. In addition, any member of the Association may be nominated from the floor for any office at the November business meeting in an election year. There are six general meetings per year: January, March, May, July, September and November. The January meeting will be the Annual Meeting. Advisory Board can call special meetings of general membership with at least three (3) days and not more than seven (7) days written notice to the membership. Sec. 1 – The President shall preside over all regular and special meetings of the Association and all meetings of the Advisory Board and shall perform such other duties as are usually required of this office, including overseeing and representing the Association in all civic, legal and political matters that are relevant to the Association and/or its members. It shall also be the duty of the President to arrange for the Association’s participation in, or promotion of such civic functions, meetings, celebrations or other regular or special affairs as the membership or Advisory Board may direct. The President shall be the sole representative and spokesperson for the Suburban Civic Association, Inc.
Sec. 2 – The President shall have the right to call Special Meetings whenever deemed necessary. Sec. 3 – The President may, for the good of the Association, call meetings of the different committees at such time and place as may be needed. Sec. 4 – The President shall, at the Annual Meeting, submit a report to the Association on the work accomplished. Sec. 5 – The President shall be an ex-officio member of all committees, with the exception of the Nominating Committee. Sec. 6 — In the event of the President’s absence or inability to act of, his duties shall be assumed by the 1st Vice-President, then 2nd Vice-President, and then the Secretary or Treasurer. Sec. 1 – The 1st Vice-President shall appoint members to the Membership Committee, the Newsletter Committee and the Public Relations Committee and work in conjunction with these committees. Sec. 2 – The 1st Vice-President shall assist the President and shall prepare to assume the office of presidency as needed. In addition it shall be the duty of the 1st Vice-President to assist the 2nd Vice-President whenever deemed necessary. Sec. 3 – The 1st Vice-President shall oversee all regulatory matters, including appointing members to assist in this regard. Sec. 1 – The 2nd Vice-President shall appoint members to the Beautification Committee, Hospitality Committee, Special Events Committee and Neighborhood Watch Committee and work in conjunction with these committees. Sec. 2 – The 2nd Vice-President shall assist the President and 1st Vice-President whenever deemed necessary. Sec. 1 – Attend all meetings of the Association, both special and regular, and maintain a record of the activities of every meeting, keeping a separate report of each. Such minutes shall be available for review by any member upon request to the Recording Secretary. Sec. 2 – Attend all meetings of the Advisory Board and keep a complete record of the activities of same. Sec. 3 – Record number of members present at General Membership Meetings and Advisory Board meeting to assure presence of quorum. Sec. 4 – Maintain all business records and archives of the Association. Article 10. – Treasurer: It shall be the duty of the Treasurer to keep a current record of financial assets of the Association and to report same to the Advisory Board on a monthly basis. It shall also be the duty of the Treasurer to report to the general membership at each meeting. Article 11. – Membership Committee Chairperson: It shall be the duty of the Membership Committee Chairperson to collect the dues. They shall also maintain a proper and complete record of the membership showing the name, address and telephone number of each member. He shall provide a copy of the complete membership listing to the Recording Secretary. Article 12. – Finance/Budget and Fund Raising Committees: It shall be the duty of the President, 1st Vice-President and 2nd Vice-President to appoint members to the Finance/Budget Committee and the Fund Raising Committee and to work in conjunction with these committees. The Treasurer is automatically an ex-officio member of the Finance/Budget and Fund Raising Committees. Article 13. — Information Technology (IT) Committee Chairperson: It shall be the duty of the IT Committee Chairperson to handle all affairs pertaining to storing, studying, retrieving, transmitting and manipulating data and/or information computer related. They shall maintain and update the current Website and Email as requested by the President and with Board approval. They shall assist the secretary and treasurer in organizing current membership data and related information. The Membership Chair, the Secretary, and the Treasurer are automatically an ex-officio member of the IT committee. Article 14. – Indebtedness: No Indebtedness of the Association shall be incurred beyond the revenues of the Association. The President, 1st Vice-President, 2nd Vice-President and Treasurer are the only officers authorized to sign checks on behalf of the Association. All checks must be signed by at least two (2) authorized officers. No member, officer or Advisory Board member may incur indebtedness on behalf of the Association beyond reasonable business expenses, without the written authorization of the Advisory Board. Reasonable expenses shall not exceed $200.00. All requests for reimbursement must be accompanied by a receipt and reimbursement request form. Article 15. – Advisory Board: The Advisory Board shall consist of all the elected officers and those members appointed by the President. The number of Advisory Board Members shall not be less than 6 and shall not exceed 20. It shall be presided over by the President, and shall, between meetings of the Association, have power to act in the name of the Association in connection with any business of the Association requiring such action. Five members of the Advisory Board shall constitute a quorum. Such action shall be communicated to the membership in the next regular Association newsletter. Article 16. – Dues: The dues of members’ shall be $10.00 per member per year or $20.00 per household. Dues shall be due and collected by the Membership Committee Chairman at the Annual Meeting. Article 17. – Quorum: Twenty-five members shall constitute a quorum at a General Membership Meeting. Article 18. – Order of Business: Roll Call of Officers – Reading of Minutes of Previous Meeting – Treasurer’s Report – Reports of the President – Reports of Vice-President – Reports of Special Committees – Unfinished Business – New Business – Adjournment. Article 19. – Amendment of By-Laws: These by-laws may be amended on the recommendation of a special committee appointed by the President at any time, whose report, when approved by the Advisory Board, may be adopted after one presentation at any general meeting, followed by publication to the membership by newsletter and majority vote at the following meeting. Amendment to the reports so presented may be moved at the time of vote but no new by-law shall be presented without publication to the membership-at-large prior to its presentation. The By-Laws shall be reviewed by the Advisory Board on an annual basis. Article 20. – Fiscal Year: The Association’s fiscal year shall begin on January 1. The foregoing Constitution and By-Laws of Suburban Terrace Civic Association, Inc. become effective upon approval. BRRRRRRRRR, we have had some very cold days this winter. Happy New Year to you all. I have had a wonderful 2017 and I am looking forward to an even better 2018. I have learned a lot from some very seasoned individuals who give of their time selflessly year after year. Their excitement has welcomed the younger generation to our board and the diversity of knowledge has propelled us to a better understanding of our neighborhood. We have accomplished some of our goals, while others are still in progress and are looking forward to setting new goals for the improvement of our neighborhood this year. It is important for you to have a voice in setting goals. If you are a returning member we thank you for your trust in us to serve you and if you are becoming a new member we welcome you with open arms. Our November General Membership meeting was about getting to know your neighbor and it was a great success. We had lots of fun with games and the turkey raffle. I hope the turkey winners enjoyed their dinner and we hope the gift card winners spent them wisely. Our 2nd Vice President Emily Rey did an outstanding job presenting our neighborhood history. Thank you Emily for all the valuable time you spent researching our history and for giving an excellent presentation to all. We would like to thank the many members in attendance for sharing their history stories about their parents and grandparents. Our neighborhood is unique with respect to generation after generation wanting to stay here. Thanks to all of our members in attendance, your support keeps us going. The general membership meeting will be held on Tuesday, January 9, 2018 at Jefferson Playground, Room #2 on the second floor of the gym. The doors will open at 6:30 pm and we will start promptly at 7:00 pm. The election for Sheriff and Constable will be held on March 24, 2018 and we feel it is important to meet the candidates. Our two guest speakers, Mr. Jack Rizzuto and Mr. Allen Leone, Jr., are running for Constable of the 5th district which is our area. We thank both men in advance for joining us and wish them luck for the election. This will be a great opportunity for you to meet the candidates face to face. We will also take the opportunity at this meeting to review where we have been and where we want to go with our civic association. Please take a few moments to think about the goals we need to set for our organization to continue to move forward. We will also be voting on the updated By-Laws for the Civic Association. If you have not seen the new By-Laws than please go to SUBURBANTERRACE.ORG and the new ones are under the STAY INFORMED section. The hot topic of the US mail issues will be discussed at this meeting. I have been in contact with Ms. Hales at the US Postal Office handling our situation and have been asked to supply them with information about the problems that are occurring. I need very specific information from you regarding the issues. We have put together a questionnaire to help gather this information and it can be found on the Website (SUBURBANTERRACE.ORG), found in the STAY INFORMED section. We thank anyone in advance for donating a dessert for the community table and we will most graciously accept all. Please mark your calendars for our membership drive on January 20, 2018 at 10:00 am. Pease let us know if you can volunteer to help spread the word. Also we would like for you to mark your calendars for our March Meeting. The date is March 13, 2018 at 7:00 pm at Jefferson Playground, Golden Age Center. We will be hosting the candidates for Sheriff. We wish you all a Happy Mardi Gras! I would like to apologize to you all for missing the Night-out Against Crime Party; my kidney stone had other plans for me. (OUCH) Many neighbors have told me it was a wonderful, well attended party. I would like to thank my vice president Stacey Spies, 2nd vice president Emily Rey, secretary Kim Catalano, treasurer Rhonda Gauthier, board members Al Wilson, Jeanie Knesel, Sandra Roche, Blaise Leblanc, Waynette Glade, Sebastian Rey, and Max Summerville for an outstanding job of coordinating, setting up and supervising Night Out Against Crime party. We have an exceptional team of devoted neighbors and you make our civic association great. Thank You, Thank You, Thank You. Our September General Membership meeting had a packed agenda. There are many to thank. We had a surprise visit from our new Sheriff, Joseph Lopinto, who shared his interesting background with us. It was wonderful getting to know him. We are very grateful to our Jefferson parish police department for sending First Lieutenant Joshua Wingrove, Lieutenant Cartier and Deputy Taranto. They presented the crime stats for our area and it was an eye opener for us all. We appreciate Corinne Villavasso for introducing the Geaux NOLA Ride Share Program. Thanks to Tyler Dugas with Jefferson Parish Department of Sewerage for bringing us up to speed on our aging sewer system and the projects in place and pending to keep Jefferson parish moving forward. Francisco Miramontes presentation on self-defense was so much fun. He did an excellent job and hopeful we will never be left defenseless. Thank you very much Francisco for empowering us. Thanks to all of our members in attendance, your support is inspiring. The general membership meeting will be held on Tuesday, November 14, 2017 at Jefferson Playground, Golden Age Center. The doors will open at 6:30 pm and we will start promptly at 7:00 pm. Our guest speaker will be our very own 2nd vice president Emily Rey. Emily has taken the time to research our neighborhood’s history. I feel as though our history is as important as our future. I have had the opportunity to review some of the report and it is so interesting. In preparation for the Thanksgiving holiday we have purchased 3 turkeys to give away. Best of luck to you all. In the spirit of giving we will be collecting can goods for the food bank. A big thanks to everyone who can donate. Also please mark your calendars for our January 2018 general membership meeting. The date is January 9, 2018 at 7:00 pm at Jefferson Playground, Golden Age Center. This annual meeting will highlight the past years accomplishments and our goals for the new year. Please help us by brainstorming ideas for the future progress of our neighbor and the improvements you would like to see. We wish you all a Happy Thanksgiving and A Blessed Christmas! My goodness, so much has happened since our July General Membership meeting. My emotions have been run amuck with Hurricane Harvey; the now infamous Hurricane Irma with Hurricane Jose’ on her heals and to our South Hurricane Katia. We have been very Blessed this hurricane season to date and pray we all stay safe for the remainder of this season. I hope the meeting in July was helpful in giving you important information in order to prepare for this very active hurricane season. May we all continue to pray for all of those affected by these terrible storms and continue to donate generously to the cause. We would like to thank Robert Greene and his staff with Jefferson Parish EOC for his excellent presentation. He presented visual outlines on the large screen and prepared a stack of excellent handouts. Many thanks to Home Depot and there staff for putting together an outstanding presentation about hurricane preparedness. Thanks to Home Depot Manager Jackie Springer and employee Jack Strain for giving their time to educate us on supplies needed. Timothy Myers of Lightning Services, Inc. spoke about generator safety and shared some very valuable safety tips that I was unaware of. We thank him very much for his professional experience. Thanks to all of the members in attendance, your support inspires us to work even harder.. The general membership meeting will be held on Tuesday, September 12, 2017 at Jefferson Playground, Golden Age Center. The doors will open at 6:30 pm and we will start promptly at 7:00 pm. Our guest speakers will be Corinne Villavaso , Tyler Dugas, Deputy Stacey Taranto and Francisco Miramontes. Deputy Stacey Taranto with Jefferson Parish Police department would like to introduce herself to our membership and present the “Crime STAS” for our area. PS: There is a possibility that our New Sheriff Lopinto may stop by to introduce himself. No Promises. Francisco Miramontes ( Pu Sa Bum Nim Francisco Miramontes) has studied Kuk Sool Won for the last 17 years and has 14 years of teaching experience under his 3rd degree belt. He is the owner of Kuk Sool Won of New Orleans and also finds time to teach classes at Xavier University. He will teach us some easy “Self Defense Moves”. We hope you all mark your calendars for our neighborhood NIGHT OUT AGAINST CRIME party. The date is October 17, 2017 at 6 pm to 9 pm. Our event will take place in the parking lot of the Golden Age Center located in Jefferson Playground. We will have the Rock N Soul Band for your entertainment, food & drinks for your tummies and fabulous door prizes. We look forward to visiting with all of our neighbors. Also please mark your calendars for our November general membership meeting. The date is November 14, 2017 at 7:00 pm at Jefferson Playground, Golden Age Center. We are working hard to put together a presentation on the history of our great neighborhood. I am looking forward to learning about how our great neighbor came about. Please continue to pray for our neighbor Rep. Steve Scalise, his family and all those who have been affected by the forces of Mother Nature. We wish you all a Spooky Halloween.